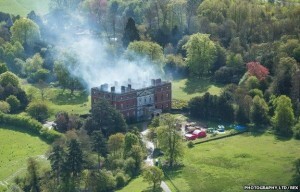 The fire last week at Clandon Park in Surrey has reduced the house to a shell. It was an imposing 18th Century house, built in the Palladian Style for Thomas Onslow whose great-grandfather. Sir Richard Onslow, an MP in the Long Parliament had acquired the estate about a hundred years earlier. His family have been active in English political life since then but by the 1950s the cost of maintaining Clandon Park had become prohibitive and it was given to the National Trust. Clandon Park had marble chimney pieces by Rysbrack. It housed the Gubbay collection of furniture and porcelain; Meissen figures; and Mortlake tapestries. It was also the home of the Surrey Infantry Museum. But now it is no more. Aerial photographs show it to be a shell, open roofless to the sky. Sir Simon Jenkins, the chairman of the National Trust until last year, wrote in yesterday’s Sunday Times urging its reinstatement as a facsimile, as it would have been when first built. “What better task for a new generation of curators and craftsmen? What more intriguing process for visitors to witness?” he writes. But this is a sad attitude. It suggests that the past was always better than now. It lacks confidence in today. And it ignores what Clandon really was. The house burnt out last week itself replaced an Elizabethan building. Its interiors were altered later in the 18th century. And as Jenkins himself writes, “Its porch was Victorian”. Whilst the house, designed by the Italian architect Giacomo Leoni who helped bring Palladianism to England, is reckoned to be his masterpiece, the truth is that it is no more. The building’s contents had been assembled by the National Trust since the 1950s. In reality it was a museum, and Jenkins’ proposal is to refurnish it commenting that “The world has 18th century furniture and artworks aplenty”. Would that really be so special? To bring some of the world’s abundant 18th century artefacts to a house rebuilt to pretend to be the original. But that would not recreate the original, because the original was a home, and the rebuild would be a museum. A facsimile will not be truthful. Rather it will promote a rose-tinted view of the past. We forget when we look at these places that life expectancy in the 18th century was short, infant mortality high, hygeine poor, pollution abundant, travel and leisure the preserve of the rich. We forget also that the architects of the past used the best of the technology of their day. We forget that Georgian windows owe their beautiful proportions to the technology of that day – the panes were the largest that could be produced using the most advanced techniques. Why not instead accept that a catastrophe has occurred a Clandon? The house of yesterday has been lost. It may be that there is a desire still to admire the beautiful Palladian architecture (though, as with 18th century furniture the world is not short of glorious Palladian architecture either, e.g the Queen’s House at Greenwich and the White House in Washington, not to mention many of Palladio’s own masterpieces around Vicenza) in which case Clandon could be retained as a ruin. But surely we should ask rather what is actually needed at Clandon Park in the first quarter of the 21st century. Is the need actually for a museum? What are the choices? Might someone want an isolated new house in the countryside? If there is some need, then let us build something which has the confidence to anounce that it is a 21st century creation, something in today’s style, designed by one of today’s great architects, someone with the confidence to change what we see, to leave a visible mark, to do better? Let us use the technology of today to produce a building of significance, perhaps better than the Clandon Park of yesterday. Or will we just produce a replica, something which pretends to be that which it is not, which deludes its visitors and the uninformed, a monument to backward looking thinking? 7 comments to Clandon Park – what next? The site should be rebuilt – albeit with modern safety and materials. The past should be preserved – to demolish it all and sell it for development would be sinful. Exactly, MC – you state it yourself – in England/perhaps the US people “love old things TOO much”. I stress the ‘TOO’ – as not being objective, and actually as inappropriate and backward. I’m not saying turn Stonehenge into a drive thru’ McDonalds and St Paul’s into a huge soft-play ball-pit; I’m just saying England has loads of old structures and perhaps TOO much of it is protected. The top stuff is worth saving, of course it is, notwithstanding my forthcoming “Nobel Prize in Blind Philistinism”; but is the “brickwork and masonry” at CP that good it has to be left standing, as a fire-wrecked monument, for ever & ever? That comes across as rather self-indulgent and mawkish to me. Now where’s my copy of “Let’s Go: Iraq & Syria”? The thing is, Britain HAD loads of old structures but they have been demolished in the thousands. Now the National Trust will probably preside over many more closures and fires as they try to milk the cash from their properties. Clandon has had its ups and downs since it was built but such a house represents a lot of lives and history. Not to mention its role as a War hospital. reproducible. The roof probably was overdue for repairs anyway. All the joinery can be easily copied. The big challenge is the wonderful plaster ceilings. parts of the house would have been subject to repair and replacement over its lifetime. The house became rather derelict when unoccupied for decades in the 19th century. recoverable from the ashes. The paintings are a big loss but could be copied. So the house is not ‘all gone’ but very much still there. But it may be a big financial drain on the Trust as I doubt there will much insurance support. I am putting forward Doctor Lang for a Nobel prize in Blind Philistinism. His attitude makes me shudder at the disregard for the sheer beauty and lost skills of such fine construction, nearly 300 years ago. Clandon was at the very top of the architectural ranks, not just another superfluous edifice. The shell of the house remains standing proud at least as a monument to the amazing high standard of the brickwork and masonry. The internal decorations, paintings, furniture and ornaments had a completely English harmony and lacked the fussy excesses of the continental style. Few other Trust properties were so eloquent and unspoiled. Dr Lang, America is the place for you – or maybe you are already there. No, maybe even they love old things too much – try Iraq or Syria now that IS are getting the ancient cities bulldozed. I couldn’t agree with DB more. The House as it was is gone, fingertip search if you want and salvage what you can – but to re-build / repair would be a fake. There is way too much conserved these days anyway – would we really miss the ‘bottom’ 10%, or even 25%?? Locally listed buildings and non-designated heritage assets further protect stuff not really worth of retention – take some photographs and then move on. At this place – sell the site to someone insanely rich to have their country mansion and use the money to maintain other houses which have not burnt down. I couldn’t disagree more with your ideas. Firstly, a modern house can be built anywhere so why impose it on a site with history. Yes the house was a museum as are most historic old houses but I remember it as hsving a very beautiful rooms in spite of its rather austere appearance. I am furious with the National Trust who are entrusted with the care of our history and artifacts. There should have been a proper emergency water supply, heat sensors and sprinklers. If it was an electrical fire then the wiring and supply has been badly installed and badly maintained. I note the draped wiring in various shots of the burned out rooms. It should have all been in steel conduits where hidden behind walls. This fire was not bsd luck, it was inept management. No doubt the insurance company will question what precautions were in place and push the Trust back into conserving its own funds by dismantling the shell and selling the bricks and remaining Marble chimney pieces. Looking carefully at the photographs I would estimate the main all brick structure of the house is 99% sound. The Marble Hall was partially constructed in wooden ‘faux marble’ pediments and mouldings around the grand marble edifices which have mostly survived the flames. I suspect the upper columns were also wood. The windows and Hall ceiling have been recently restored so that can be repeated. The rest is timber – probably much in need of replacement anyway. As you say, this was once a home. It should be repaired and reinstated as a building. I fear the Trust will take the cheap way out – thus shirking it’s sole responsibility to preserve. I hope a scaffold roof is quickly erected and the brick walls and chimneys made secure. A fingertip search of the ashes will reveal much that can be rescued and conserved. It it far from being ‘all gone’ except for timber and laths. I have personal experience of the recovery of a burned out building and know that it can all be repaired with patience and skills and will by a work of quality again not a mere replica.